In this post, I would like to translate in full a conversation in Greek that a pilgrim had with the Elder Porphyrios. A psychologist of the cognitive ilk will no doubt recognize in the following conversation an example of how meaning assignment can influence mood. The believer, however, will see testimony to the transformative power of Christ’s Resurrection. 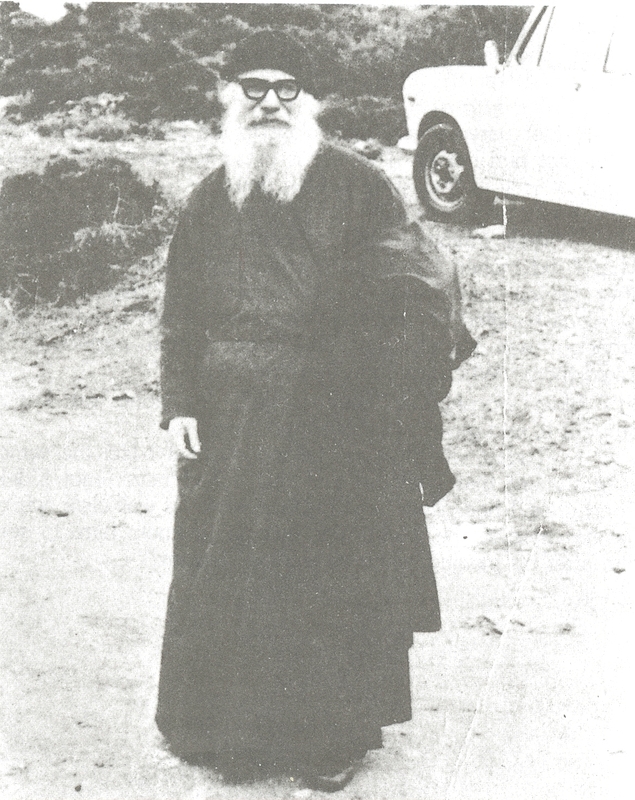 This conversation with the Elder Porphyrios contains precious advice on how we can make the Church’s experience of Christ’s resurrection our own and how doing so can enable us to look at all things through the resurrection of Christ and hence be victorious over the gloom, the sadness, the failure, and the death that seem to surround us. The Church’s hymns have great power, but we must focus on them, internalize them, and let them fill the horizon of our mind like the blazing sun fills morning sky. Saying the words slowly, we try to understand the universe of thought and feeling contained in each phrase, which ultimately means to live each phrase with body and soul, to experience a shift in emotion and a change of heart, so that we find ourselves translated from our little world with its petty problems to the world of Christ’s radiant resurrection where we will be forever with Him. Yes, the Elder Porphyrios was well aware of this patristic teaching. I think it is also worth mentioning that on the Holy Mountain of Athos, the Paschal Canon is sung on fourteen, which means each troparion like the one the Elder Porphyrios referred to is repeated about seven times. There is a purpose to that repetition. These powerful words written by Saint John of Damascus can reorder the soul and give it the strength to face any adversary and certainly any assault by gloomy, dark thoughts. They enable us to put our thoughts, the things that happen to us, even our entire lives into the proper perspective, being that Christ, our Christ has triumphed over death and changed everything forever. He invites us to enter “another way of life that is eternal.” And one simple way to begin is to just slowly say the following words as though we mean them: “We celebrate the slaying of death, the destroying of hell, the beginning of another way of life that is eternal. And leaping for joy, we sing a hymn to the Cause, the only blessed and most glorious God of our fathers.” And then to live in accordance with what we have just said. This is just wonderful. I literally just finished reading that section in your book. I am going to print this out and read it frequently. Thank you again, Theresa, for your kind words! I think it is worthwhile to read this small hymn very slowly to get the sense of each word and eventually to commit it to memory, so the soul can focus on it alone. Such an inspirational article, and very true. Fr. Alexis, I enjoyed the new book on Elder Paisios that you helped translate, and wonder if there is anything in the works for Elder Porphyrios. I have Wounded by Love, and my copy is falling apart from reading and re-reading over the years. It would be nice to have a more thorough, well-edited life of the Elder, who is probably my favorite contemporary saint. I am reading your book on Ancient Christian wisdom and cognitive therapy and find it very interesting. Thank you so much, Shelly, for your feedback. I have always loved the saying and recorded talks of Elder Paisios and Elder Porphyrios. Although their words are usually simple, they have a divine depth and a sacred power stemming from their own lived experience of Christ’s glory. Wounded by Love is among the first books I usually recommend to those interested in the spiritual life. Unfortunately, that is, at present, the best work on the Elder Porphyrios available in Greek. I suspect in time, though, a more thorough life will be compiled. I should also add that the idea for my book on Ancient Christian Wisdom and Cognitive Therapy ultimately came from Elder Paisios’s many comments on the power of a single thought to heal or to harm. Thank you, once again. This does sound like a wonderful read *Wounded by Love*. I love the title. I will have to look into it. I am learning so much from your book. I am going to talk my spiritual director into purchasing one. I know that this will help with the process of inner healing in my own life. Thank you. Father, bless. How interesting that I resonated so much with both of your books, since Elder Porphyrios heavily influenced your book on Ancient Christian Wisdom. I have another idea for you (I used to work for Conciliar Press in marketing.) Have you considered doing a layman’s level understanding of this book? Maybe a little less intellectual? I have studied both theology and psychology a bit so understood it, but it might be more accessible to the average reader if you simplified it for a wider audience. Just a thought! BTW, I always tell my husband that I have a peasant’s faith. Very simple. 🙂 He is a scholar and theologian! The Lord God bless you, Shelly! And thank you for your idea about a layman’s version. Others have made that suggestion and I may at some point try to do just that. For the meantime, the blog in its less-ordered way presents material from the book or parallel to the book in what I hope is a more accessible voice. Sometimes, the connections between the Church Fathers and cognitive therapy are such that a certain degree of complexity and subtlety is necessary to avoid straying on the right hand or on the left, but the ideas from both areas are at root quite simple.